We recently did a very touristy thing in the name of research: Ride the Ducks (warning: if you click on the link, the music starts automatically). We were hosted guests. Of course this was during the BART strike, so we were concerned about how hard it would be to get there. Turns out it wasn't so bad. 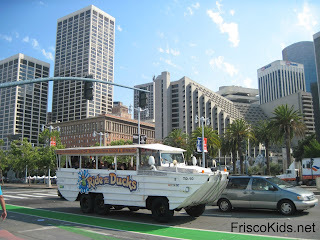 Oddly, the Duck route roughly mirrored (in reverse) our trip from Caltrain to the wharf, via the #30 bus. Here's what you'll see on the tour. When you get on, you get duck whistles, which you're encouraged to blow at various times (and discouraged when siblings start screaming at you to stop). Our tour started at Fisherman's Wharf, where Captain Dan (i.e. 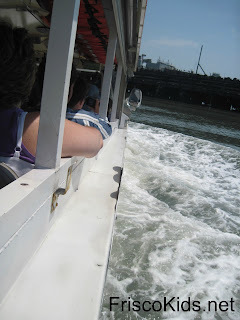 Captain Jess Kiddun) explained the wharf's origin. Not surprisingly, it's always been a place where the fishing boats are based. The fishermen opened their own restaurants and stands to sell to customers directly, without a middle man. -The Cannery in Fisherman's Wharf was the largest beach cannery in the world, and was operated by Del Monte. It's made from bricks recycled from the 1906 earthquake. -The original Rice-a-Roni commercials from the 50s were filmed at Hyde Street, with the cable car. 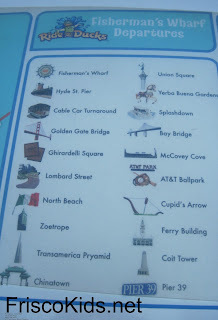 -The cable cars are the only international moving landmarks. -In 1870-80s, the trolleys were operated by horse. According to Captain Dan, an accident where the cart/horses fell down the street, lead to the development of the current trolley. -14 men escaped from Alcatraz while it operated as a prison. -The Golden Gate Bridge just celebrated its 75th anniversary. 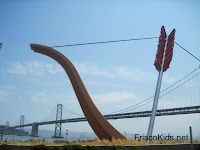 -The tallest bridge tower in North America is the new Bay Bridge segment. -The Transamerica Building is the tallest building in SF (I thought it had been surpassed by now, but independent research indicates it's still the tallest). -North Beach used to be on the water, and the water was filled in after the Gold Rush, so it's no longer beach-front property. -The Godfather was produced in North Beach, in the Sentinel Building in North Beach (916 Kearny), where Zoetrope was based. -San Francisco's Chinatown is the longest-continually run North American Chinatown, and was started in 1848. -There are 300 restaurants in the 10 square blocks of Chinatown, so don't ask Captain Dan for a recommendation. -Union Square is named after the Civil War, because rallies for/by the Union soldiers were held here. -Union Square had the world's first underground parking garage. In 1941, it was used as a bomb shelter. -The San Francisco Mint, built in 1875, made dimes. 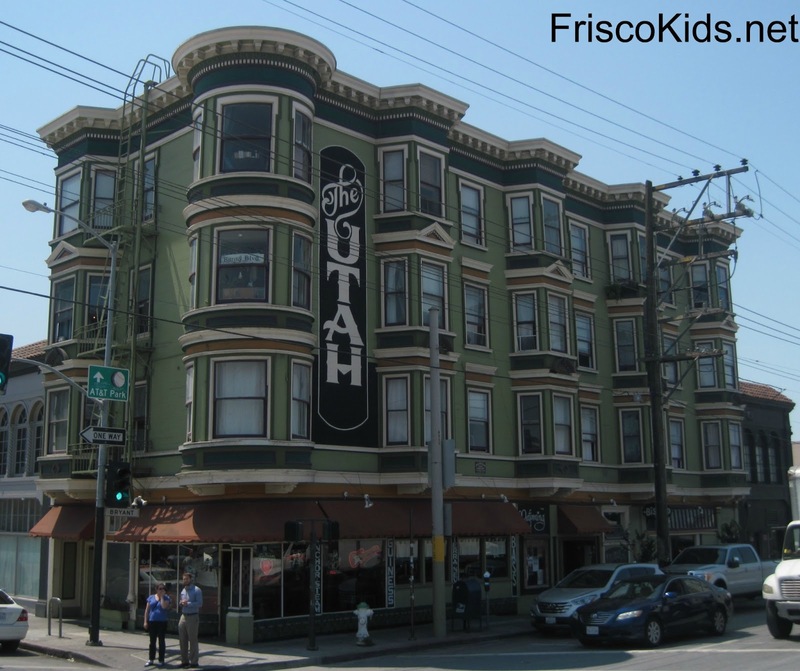 -The Hotel Utah (pictured at right) is where Robin Williams and Whoopi Goldberg started their careers - with open mic night. Also, Carlos Santana played his first set there. At this time (we're now in South Beach), my son said "when are we going in the water?" I don't think that Captain Dan heard him, but he said over the speaker "about this time, kids start asking when we're going in the water." And soon after we did. Ride the Ducks has three launch ramps. Captain Dan showed us the emergency exits: the windows. And yes, there are life jackets for all ages. The main things we saw in the water were merchant marine ships, AT and T Park (though not as close as you see it on the Ride the Ducks video on their website) and the Bay Bridge. 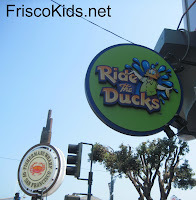 We would have loved to do the water portion of the Duck Tour closer to Fisherman's Wharf. It almost seemed we went into the water here because it's the only area they could get access to. It was fun nonetheless (no, we didn't get wet). -Oakland is the fourth busiest U.S. container port. -the Bay Bridge handles 800,000-1,000,000 cars a day. The new span opens Labor Day weekend. It's cost $7.2 billion so far, and they're having trouble with the fasteners. -AT and T Park holds 41,5000 people. 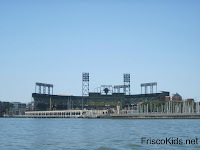 There's only one other commercial ballpark on the bay - Pittsburgh's. -Treasure Island held the World's Fair for 18 months. The 900 acre land was later home to Pan Am, which flew planes from the island for a time. The Navy then bought it. The island sinks six inches a year, and dropped three feet during the 1989 earthquake. 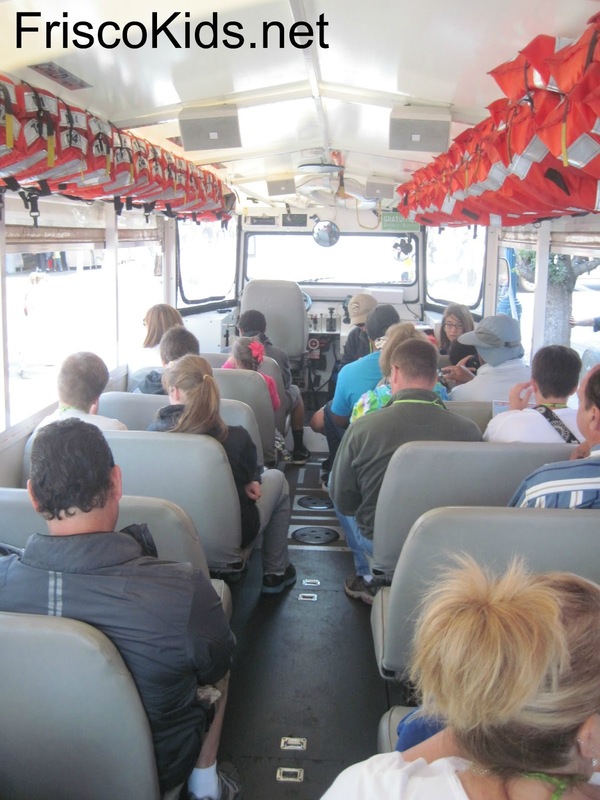 Captain Dan gave us a little history of Ride the Ducks, which opened in San Francisco in 2008 (not all Duck tours in other cities are affiliated). Drivers of the SF Duck on land need a bus driver's license. On the water, they need a U.S. Coast Guard Master's license. Captain Dan has both, but in high season if they don't have enough guides with both, a ship captain will wait for the Duck at the ramp, and hop on to do that portion of the ride. 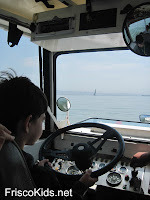 At one point in the water portion, anyone is allowed to take a turn navigating - here is Zack at the wheel. As for the actual vehicle, the wheels stay down in the water and continue to turn, giving weight and propulsion. These are not original WWII vessels. The original amphibious vehicles were designed by Sparkman and Stephens for the U.S. Army. On the way back, we drove along the Embarcadero and saw some of the America's Cup Sailing things set up (amphitheater, store). 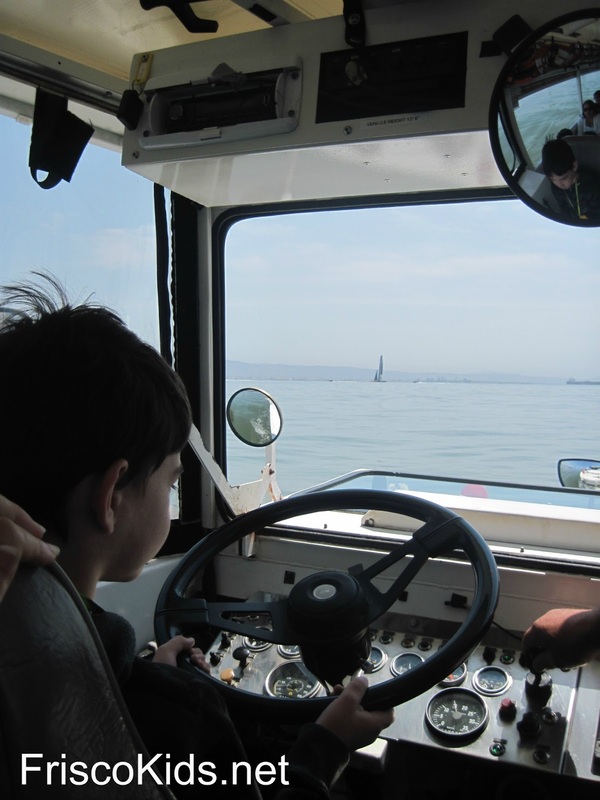 You can see an America's Cup catamaran in the distance in the picture of Zack driving. It's the first time the America's Cup is being held here. The skipper of the previous winning boat (in this case Larry Ellison) picks the city and the boat design - something I didn't know before. Only four countries have entries because it's so expensive to do it here. Due to Bay Area weather patterns, they had to change the time of the race (which messed up the TV schedule), and the boat design has been heavily criticized since it's prone to accidents (including one fatal one already). As for Captain Dan, he thought was a little funnier than we thought he was, and talked a bit more than necessary. But he had his funny moments, playing music for our moment of silence for our "dearly departed duck friends" as we drove by a Chinatown butcher. And he was upbeat and informative (and we didn't get hit or drown!). The meeting place is in the center of Fisherman's Wharf. If you recognize the sign in the background, you'll know exactly where this picture was taken. We had fun on the tour and learned a lot. At full price, I'd say it's a tougher sell for locals since these are areas you probably know well, even if you're learning a lot. 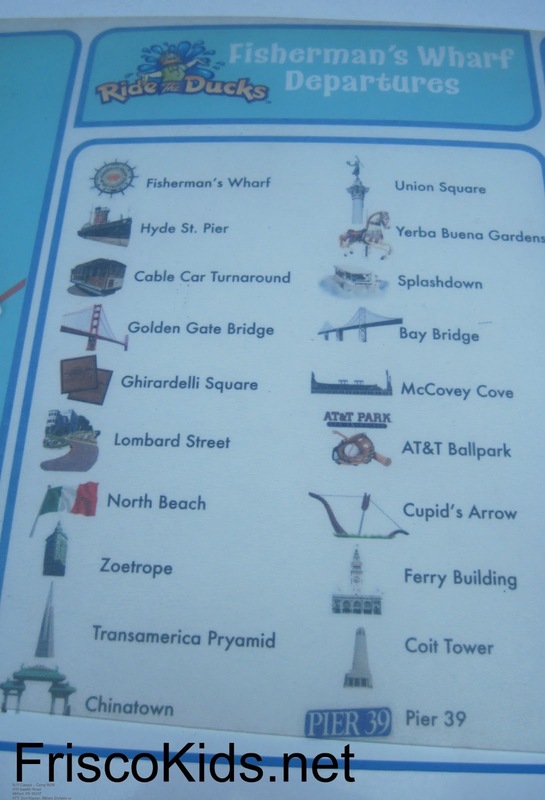 For visitors, it's a fun way to get to know San Francisco. Fortunately there are often deals, which may prompt locals to do something touristy, whether or not you have out of town visitors. Other info: use the public bathroom in the Wharf parking lot behind that Wharf sign above, before or after. Tickets: Tickets are $35 (ages 18-61), $32 (ages 62+), $25 (ages 4-17), free (3 and under, but they still need a ticket). 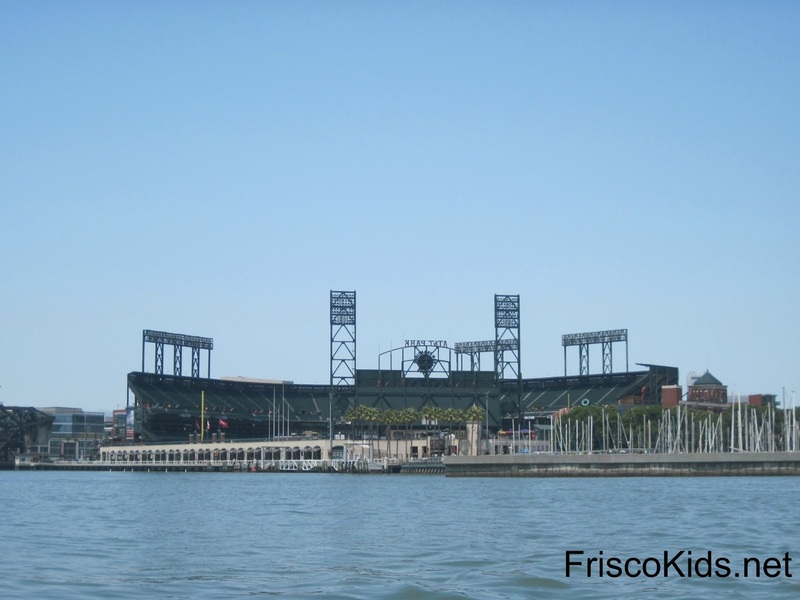 They offer combination tickets with the Aquarium of the Bay, San Francisco Giants and Blazing Saddles Guided Bike Rides as well. Discount Ride the Ducks Tickets: You'll save $3-7 per ticket if you go early (10-11:30 a.m.) or late (after 5 p.m.) and buy your tickets online. Goldstar often has Ride the Duck tickets for $17.50. When I got this link, the Goldstar tickets were sold out through September. Check out Priceline.com which had tickets around $27. More Info: call (877) 887-8225 or email info@sanfranciscoducks.com, or check out their website. Disclosure: We received review tickets to Ride the Ducks for review purposes. All opinions are my own. Please vote for Frisco Kids! Do you give a cup?